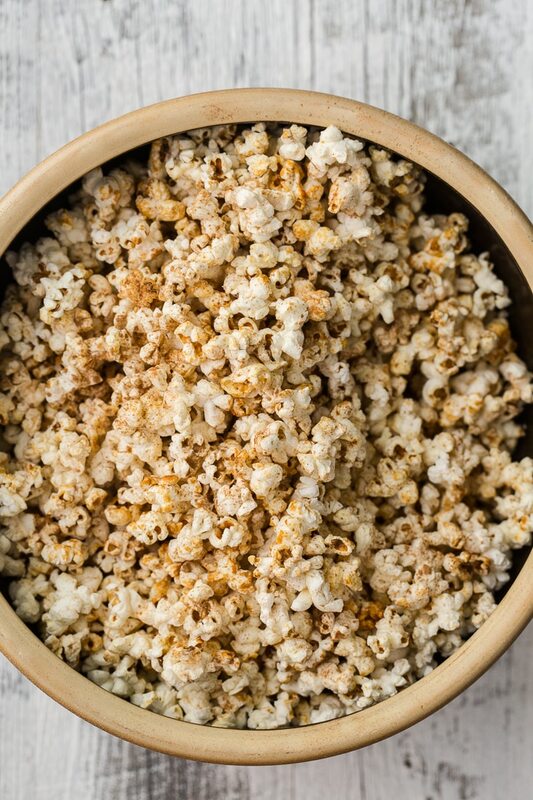 Cinnamon Honey Popcorn | Naturally. Over the past months, I’ve stockpiled a list of tv shows and movies I wanted to watch in anticipation of the first few weeks after the baby is born. I’m normally don’t spend a ton of time on either, but usually one weekend evening is reserved for movie time with M. We grab all the pillows from the house, curl up on the couch, grab a few snacks, and settle in for a movie (this has become even more of an affair since we purchased and actually started using a 3D tv- I was skeptical at first but it’s actually really cool). The snacks for the evening usually revolved around our favorite tapas meal of olives, cheeses, and fruits but I always make sure we have a big bowl of popcorn ready to go as well. Who ever paired popcorn and movies together was pretty much amazing (and it turns out, there’s quite a story behind popcorn/the movies). Heat oil over medium-low heat with 3-4 kernels. When the oil and kernels begin to sizzle, add the remaining kernels and toss to coat. Once coated, sprinkle sugar on top and cover with a lid. Every few seconds shake the pot back and forth so that no kernels burn (give it a good shake!) Continue to do this through the popping. This popcorn also keeps well in a plastic bag for a couple of days! This looks great! My youngest loves popcorn it is his go to snack and he also loves cinnamon! We are going to have to give this a try!! Oh, this recipe sounds like a good one. I could get kids to eat this and it’s vegan. Btw… How is Erin doing with her brand new baby? I LOVE fresh popcorn – my favorite snack (and sometimes I make a meal of it I’ll admit). Usually my go-to is lime and chili powder but this would be a great alternative if I have a sweets craving. Does the honey make it impossibly messy? Amazing! Took awhile for the popping to start but it was worth the wait! Wow I deffo wanna try some new popcorn flavours! I love popcorn, my fave snack for sure! And thanks for posting the article about popcorn and the movies, so interesting! This looks to die for! Obsessed with popcorn! 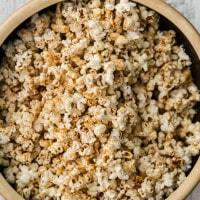 I recently posted a non-GMO organic caramel popcorn recipe. I can’t wait to try this recipe for another sweet popcorn. This looks amazing. I will try this soon. YUM! I love cinnamon popcorn! Thanks for the idea of using cinnamon and honey on my popcorn – I regularly make it using coconut oil, and the more I think about adding sweetness and warmth with cinnamon and honey, the more I want them right now! I was convinced I was doing it wrong when it took a while to start popping, but I’m glad I stuck it out. This is delicious!! sounds awesome! Have you tried adding the cinnamon at the beginning with the honey and sugar? I’m wondering if that would allow it to disperse better. Can’t wait to try this! Do you know these days when you insanely crave something yet you have no idea what that is? I experienced it today. I couldn’t even decide if I wanted something sweet or salty. It turned out, I wanted both. This popcorn was exactly what I needed. So I made this again and decided to switch up the instructions. I must have this recipe down to an art that I don’t get the burnt bottom but since it seems like it’s a reoccurring issue for some- I’ve changed it up! Hi Ella, putting the honey on after made it awfully sticky, and quite hard to stir in.. But delicious!